Please take note that the club will be hosting an OPEN doubles tournament on Friday 31st October. Registration is from 6pm to 6:30pm. Average Team Rating must not exceed 1600. 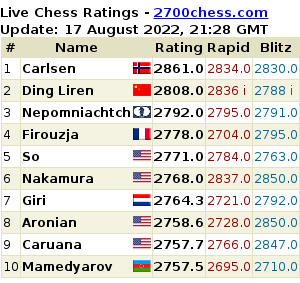 If there is a rating difference of more than 200 points, the higher rated player MUST play on board 1 of the team. The team playing white is responsible for providing clocks. GCC will be renting clocks at R2 a clock. Please bring your own clocks. If you do not have a partner and would like to play, come to the tournament as we will also be doing manual partnering for you. Also if a team exceeds the average team rating, the players will have to partner with someone else. Please pass the email on to all interested individuals. It is a fun tournament and we would like to have as many people possible. It is not limited to club members only!